You might have noticed an almost complete absence of posts about wine from this blog. Wine scares me to death. The presence of a bona fide wine expert in the family doesn’t help, either, but that aside, I know very little about wine, despite drinking my fair share of it. On the other hand, I know plenty about beer, so I don’t suppose I’m a completely lost cause. If I had a list of things I needed to just ‘do’, ‘become more knowledgeable about wine’ would be close to the top of that list. I want to spend my money more wisely. I want to know what I’m getting and feel that I’ve judged the purchase well. seemed to be written with people like me in mind. Hoggart picks out a hundred of his favourite wines and writes about each in turn. He talks about the bottle’s history, it’s heritage, it’s character, why he likes it. He points out that “there should be a certain mystique attached to wine”, but qualifies this by adding that “this is not the same as mystery”. This is the real purpose of Hoggart’s book. There’s too much snobbishness about wine. It’s too ‘exclusive’. It makes people nervous. A little knowledge can go a long way, and Hoggart provides incisive direction and advice in both general and very specific terms. You could use this book to hunt down the actual wines described, but there is as much benefit to be gained from using it to improve your general understanding of the field as a whole, to learn enough to help you to choose more wisely the next time you’re staring down a wall full of wine at the local Oddbins. Thanks, Simon, I’ll remember that. And what to actually order? “Go for the New World. Wines from Chile or Argentina, for example, are likely to deliver more flavour for your buck than the French equivalents. Never be afraid to look cheap. If it’s on the wine list in a good restaurant, it should be a good wine. If it isn’t, it’s a poor restaurant and doesn’t deserve your custom”. Life’s Too Short to Drink Bad Wines has one other trump card. Hoggart writes with a clear and precise tone, with humour and wit. Examples and anecdotes are well chosen and integral to the piece, illustrative of a particular point. There is little here that’s wasted or superfluous. Hoggart clearly knows, understands and most importantly, loves wine, an enthusiasm that runs through his writing, and much of which rubs off on the reader. Will this turn you into a master sommelier? No, it won’t, but it will help you to understand more about the basics of wine, and you’ll be thoroughly entertained whilst doing so. Thanks to Quadrille for sending me this review copy. Superb review. I should learn more about wine too! All I know is I like red, prefer it sweet, and when drinking with family, finish the bottle! I love wine as much as I love food… I don't pretend to know much about wine, but thankfully I stopped being scared of wine a while ago. 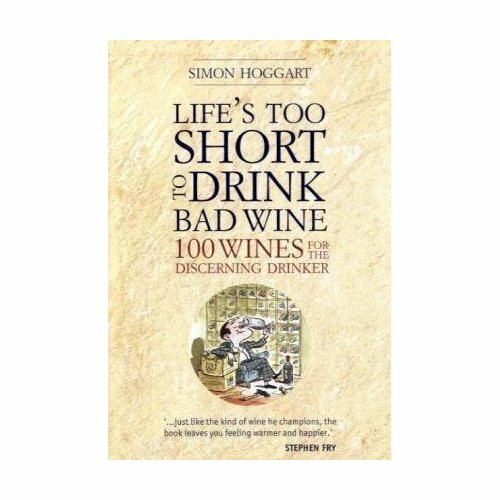 I completely agree with Hoggart's advice on picking wine in a restaurant… and I think I'll pick up a copy of his book. Sounds like a fun and delicious read. What a great review- this is great to know! Thanks! I love wine but need to learn more about it. This book is going on my to buy list. Thanks for the great review. I very much like this review, mostly because I'm a little nervous around wine-nerds (winerds!) and there can be a bit of hoity-toity-ness around vino. I like books that help demystify and educate, and hopefully make me feel less self-conscious about listing my personal choices of wines! Im the same, I love wine but don't know a lot. I do know that I love Merlot. That book might come in handy. For a wine-drinker, I am woefully uninformed. This sounds like just the ticket out of my cloud. Great post! If the book is as well written as the review… i want to get it! !